Bhubaneswar: Former Pallahara MLA Rabi Narayan Pani, who quit the Biju Janata Dal (BJD), joined the Bharatiya Janata Party (BJP) here on Tuesday. 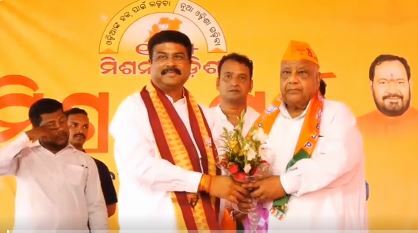 Pani joined the saffron party along with his supporters in the presence of union minister Dharmendra Pradhan at the party’s state headquarters here. Pani had on April 7 resigned from the primary membership of the BJD expressing displeasure over the party’s activities. He represented Pallahara Assembly constituency from 2009 to 2014 by defeating Dharmendra Pradhan and was the Government Chief Whip. Pani was a ticket aspirant for Pallahara Assembly seat this time after sitting MLA Mahesh Sahu was given BJD ticket to contest from Dhenkanal Lok Sabha constituency. However, the BJD fielded Mukesh Pal from the constituency this time.